This is a great simple recipe for how to cook pork chops in the oven. It is called “Indiana Pork Chops”. Season the pork chops with salt and pepper to taste, then coat with flour. Brown on both sides in the cooking oil of your choice. Drain chops, and place in a baking dish. Sprinkle chops with brown sugar. Squeeze juice from the lemons on top of each pork chop. Thinly slice the lemons and place one slice per pork chop. Sprinkle the remainder of the brown sugar on top of lemon slices and top with catsup. 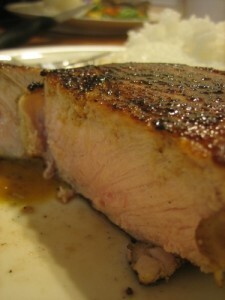 Add water to the baking dish and sprinkle 2 tbsp of Worcestershire along the sides of the pork chops. Place in a pre-heated over, bake covered for 30-35 minutes at 350 degrees. Then bake uncovered for 15 minutes more. Serve with Sauerkraut and mashed potatoes and a crunchy salad as side dishes. Red wine is an excellent refreshment.